North Korean communications technology satellite. Payload of the first attempted North Korean satellite launch. Earth observation, technology satellite, Korea North. Launched 2012. Status: Operational 1998. First Launch: 1998-08-31. Last Launch: 2012-12-12. Number: 3 . Gross mass: 100 kg (220 lb). 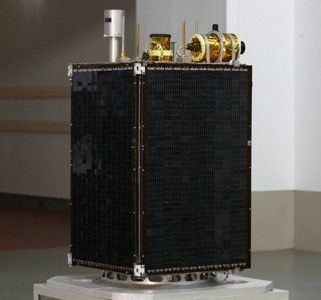 In the first attempted North Korean satellite launch it was claimed that the Kwangmyongsong was placed in an orbit of 218.82 km perigee and 6,978.2 km apogee. The satellite was said to be equipped with 'necessary sounding instruments' and to 'contribute to promoting scientific research for peaceful use of outer space'. The satellite was 'transmitting the melody of the immortal revolutionary hymns 'Song of General Kim Il Sung' and 'Song of General Kim Jong Il' and the Morse signals 'Juche Korea' in 27 MHz'. Despite these explicit details no evidence could be uncovered by Western intelligence agencies that the spacecraft had actually reached orbit. This announcement was followed on September 14 by the release of a photograph of the satellite and the claim that the satellite had completed its 100th orbit of the earth between 08:24 and 11:17 local time (2017 GMT) on September 13. Video of the launch, the satellite, and an animation of the satellite in orbit around the earth were distributed to foreign news agencies the following weekend. 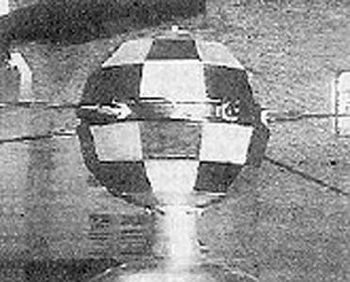 The satellite appeared almost identical to the first Chinese test satellite (which itself appeared almost identical to the US Telstar). Family: Communications technology sat, Taepodong, Technology. Country: Korea North. Engines: Nodong. 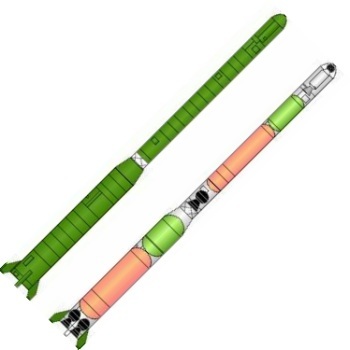 Launch Vehicles: Paektusan 1, Unha-3. Launch Sites: Gitdaeryung. Bibliography: 279, 284, 6644, 12749, 12750. 2012 April 12 - . 22:39 GMT - . Launch Site: Tongchang-ri. LV Family: Unha. Launch Vehicle: Unha-3. FAILURE: Failed at second stage separation..
Kwangmyongsong-3 - . Mass: 100 kg (220 lb). Nation: Korea North. Class: Technology. Type: Technology satellite. Spacecraft: Kwangmyongsong. Third North Korean satellite launch attempt, conducted despite international protests (that attempted to connect it with the country's missile program). Launched from a new site on the west coast of Korea on a southwest trajectory, to achieve a polar orbit and also avoid overflying Japan. Failed at first stage separation. Unusually North Korea provided the western press access to the launch site prior to the attempt, and admitted the launch failure after the fact. 2012 December 12 - . 00:49 GMT - . Launch Site: Tongchang-ri. LV Family: Unha. Launch Vehicle: Unha-3. Kwangmyongsong-3F2 - . Mass: 100 kg (220 lb). Nation: Korea North. Class: Technology. Type: Technology satellite. Spacecraft: Kwangmyongsong. USAF Sat Cat: 39026 . COSPAR: 2012-072A. Apogee: 581 km (361 mi). Perigee: 498 km (309 mi). Inclination: 97.40 deg. Period: 95.40 min. First successful North Korean satellite launch. Amateur observations showed the satellite to be tumbling, and no signals were picked up at the announced 470 MHZ frequency - it was assumed the spacecraft never functioned or failed shortly after orbital insertion. 2016 February 7 - . 00:30 GMT - . Launch Site: Sohae. LV Family: Unha. Launch Vehicle: Unha-3. Kwangmyongsong-4 - . Nation: Korea North. Class: Surveillance. Type: Surveillance satellite. Spacecraft: Kwangmyongsong. USAF Sat Cat: 41332 . COSPAR: 2016-009A. Apogee: 501 km (311 mi). Perigee: 465 km (288 mi). Inclination: 97.50 deg. North Korea's National Aerospace Development Administration (NADA, Kukga uju gaebalkuk) carried out its second successful satellite launch . The satellite, Kwangmyongsong-4, entered a 500 km polar orbit like the KMS-3-2 satellite launched in 2012. It appears both satellite and launch vehicle are very similar to the 2012 mission. The launch vehicle this time carried the name 'Kwangmyongsong' but appeared to be essentially identical to the Unha-3 launched in 2012. As of Feb 17, hobbyist observers had not picked up any radio signals from it. 0840LT SSO.